I didn't manage to get this done in time to submit any comments or concerns for the pattern test, so I was initially a bit apprehensive about blogging about it, but when I received the final copy of the pattern, every single one of my concerns had been addressed and rectified. Good job pattern testers and Marte! Other than that, this is the perfect skirt if you're into a bit of matching with your kid! For the record I am not, and given that A and I now have the same skirt pattern and a few of her dresses have been made from my leftover fabrics, I'm having to be very careful each morning! I chose the size 44 based on my waist measurement and it's a bit too big. I like it sitting fairly low, but it's a bit too low, such that the shaped waistband is inclined to stand out a bit at the top. For this skirt I had stocked up on buttonhole elastic and dutifully inserted some. But of course, 1 inch wide elastic in the middle of a 3 inch wide waistband looks pretty dreadful, so the elastic is left loose. 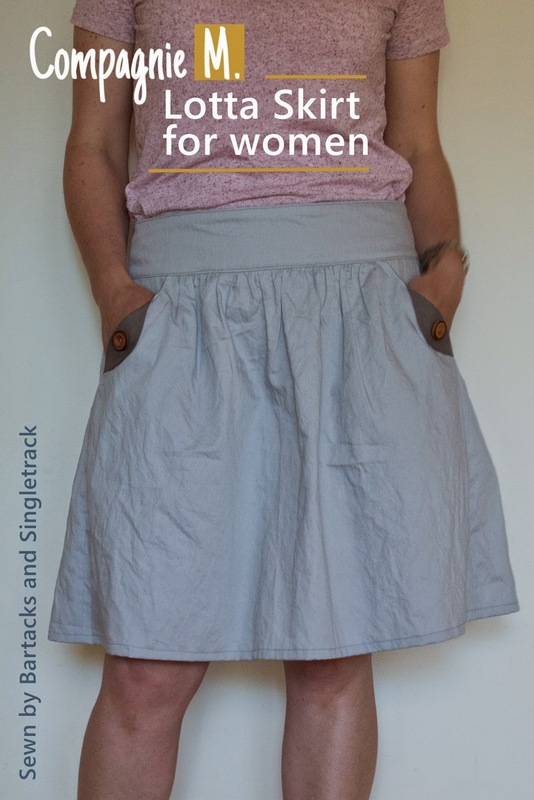 In the final pattern there are good suggestions about choosing your waistband size from a skirt you already wear and love and the idea of buttonhole elastic for grown ups has been done away with altogether. Good call Compagnie M.! I used some cotton drill that I had in the stash that has a slight silver sheen to it and which is impossible to iron to be completely crease-free. 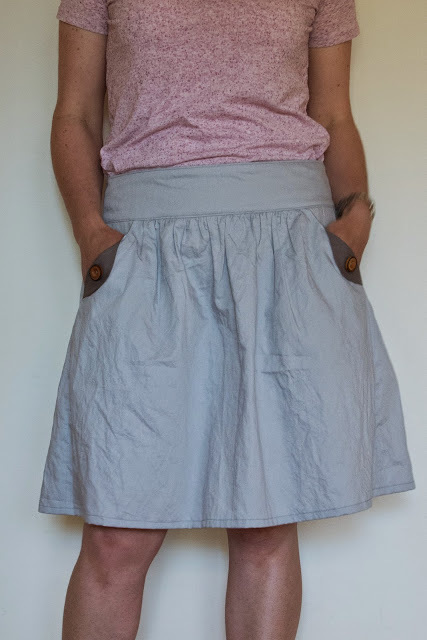 So, given that it hangs low and loose, it feels so easy to wear and I slouch around with my hands in those awesome pockets all day, I'm declaring this to be the perfect weekend skirt! 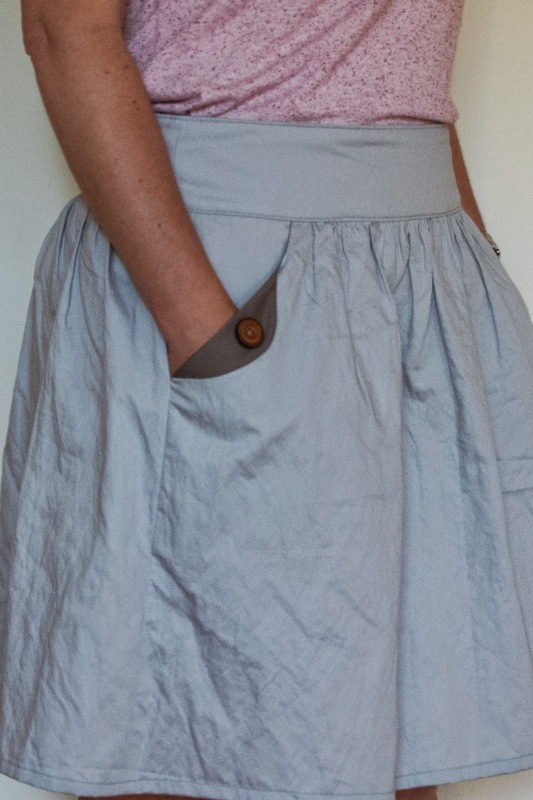 It's a fairly quick, easy sew. I made this on Saturday evening, and with my new invisible zipper foot, I'm happy to say the zipper is perfect (but I forgot to take a backside picture to prove it). I wore it on Sunday to a seaside lunch with my Wednesday night French class, and so by the end of the day I was rumpled and untucked as in the above picture. I may perhaps have had a few glasses of wine over lunch, and possibly fallen asleep in the passenger seat of the car on the way home, so this photoshoot was even more unpolished than usual (ha!) and there really aren't any head shots that don't have that winning combination of sun exposure, wine and sleep! You're not seeing my face today, but believe me, I really am happy with my Lotta skirt! Love the skirt! I like that the waistband is lower. On another note, I've been trying to resurrect my high school/college French from the recesses of my brain by listening to French podcasts. Class with alcohol sounds like much more fun! Thanks Janice. Much of what I love about French class is that it's a regular night off from home! Great color! 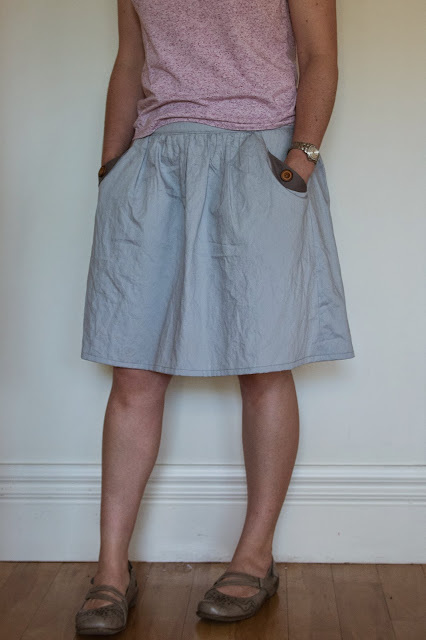 It looks like the perfect skirt to be either casual or dressy (or at least my definition of dressy!) depending on the shirt.